Just a few days before the EU referendum – on June 19 and 20 – we carried out an internet survey of the electorate in Britain and asked more than 2,100 people how they were planning to vote. Some 49% of respondents planned to vote to stay in the EU, with 51% to leave (the result was 49% remain and 52% leave among likely voters). Given that 48% opted to remain and 52% to leave in the actual referendum vote, the survey provided a fairly accurate picture of what happened. One of the biggest questions since the vote has been why older people were more inclined to vote to leave than younger generations. We found a similar pattern in our survey and may be able to offer some insight into this matter. It has been argued that attitudes towards the EU are driven by calculations that people make about the costs and benefits of membership, both for themselves and the country as a whole. Their sense of identity plays a role in all of this, as does who they listen to when making a decision. National identity is a powerful force in all this – and it comes into play when thinking about why older people seemed more inclined to vote to leave the EU. When asked a question about whether they feel British, English, Scottish, Welsh or something else, respondents in our survey north of the border were likely to say they were Scottish rather than British. But a change is also occurring south of the border as well. Many people said they were English rather than British. 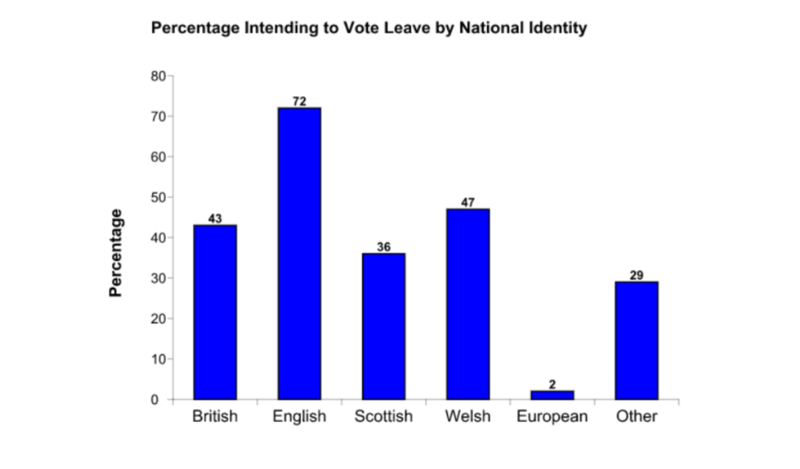 The majority of people who identified as British opted for remaining, while the people who identified as English were strong supporters of Brexit. Importantly, no less than 44% of over 65s think of themselves as English but only 21% of the under 26s think this way. Perceptions of being English increase with age, and this is one of the reasons why older people supported Brexit. In the survey 21% of people below the age of 26 voted for Brexit compared with 69% of people over the age of 65. Another aspect of identity politics relates to the immigration issue, which played a really important role in the referendum. Some 52% of all respondents thought immigration would be better controlled outside the EU and only 3% thought it would be worse. The immigration issue is primarily about threats to identity and culture resulting from people coming into the country without any apparent controls. Most people saw Brexit as a way of tackling that – which trumped economic concerns. When it comes to the costs and benefits of the EU, perceptions vary according to whether or not you are someone who wins or loses in the global system. Our survey showed 64% of graduates were planning to vote to remain compared with only 25% of people with no formal qualifications at all. Some 58% of people in professional and higher management jobs wanted to remain compared with only 27% of people in unskilled jobs. 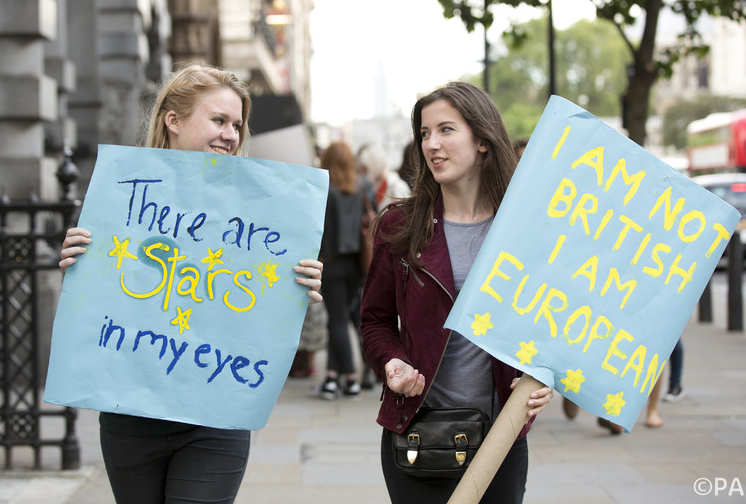 Not surprisingly, high-status individuals with marketable skills favour UK membership of the EU, whereas people who lack these skills and are vulnerable in the labour market are opposed. The same applies across the regions of the country. People in relatively prosperous regions such as London supported remain, whereas people in poorer areas such as the North-East of England opted to leave. The evidence is pretty clear that reducing tariff barriers and harmonising regulations across countries stimulates trade and creates jobs and prosperity. But if most of the gains from this go to the affluent and skilled and many of the rest are left behind, then the losers in the globalisation process will challenge the whole idea. Disappointed remainers protest after the result. By analysing the referendums that took place in Europe during the 1990s to decided whether Europe should integrate more closely, we can see similar themes at play. These votes on the Maastricht Treaty were best interpreted as public reactions to short-term, national and domestic issues rather to long-term considerations about the future of the European Union. Voters mix up domestic politics with those of the European Union. The relative unpopularity of national governments led to the rejection of the Maastricht Treaty in Denmark and the near-rejection of it in France. This contrasted with the vote in Ireland, which had a much more popular government at the time, and where the referendum passed easily. 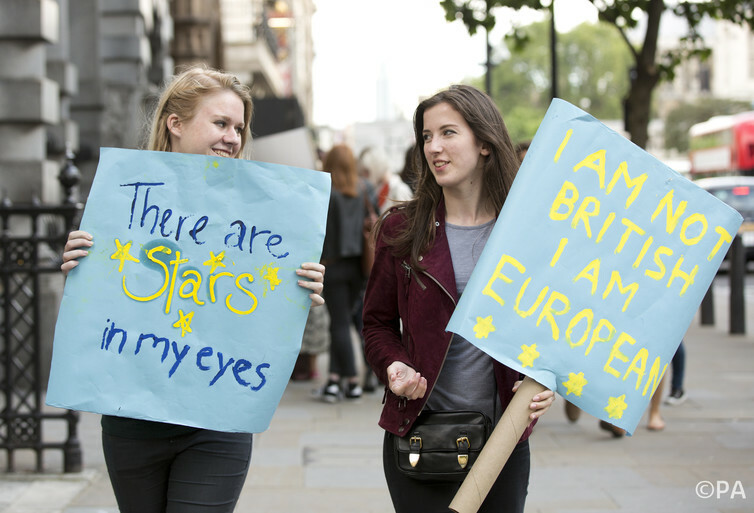 It seems attitudes to EU integration are closely tied to domestic issues. So the austerity pursued by the British government after the 2010 general election has implications for the referendum vote. Since 2010 the government has systematically reduced funding for deprived areas of Britain. It is a safe bet that when the government started cutting the budgets for deprived communities in the North of England, it did not realise the decision would come back to bite them in the form of a large vote to leave the European Union. The final factor relates to who people listen to when making up their minds. Much of the comment during the campaign focused on David Cameron’s failure to persuade Conservative voters and Jeremy Corbyn’s failure to persuade Labour voters to vote for Remain. However, the evidence suggests that this was a much bigger problem for the prime minister than for the Labour leader. Some 62% of respondents in our study who think of themselves as Conservative supporters said they would vote to leave, compared with only 27% of Labour party supporters. We also found that 36% of Scots who identified as SNP supporters were in favour of Brexit – even though party leader Nicola Sturgeon is staunchly for remaining – and plans to push for Scotland to continue to be part of the EU. So it’s far from true that Scottish Nationalists uniformly supported the SNP line. If Sturgeon’s aim is to leave Britain in order to join the European Union, it may not be a walk on the park.